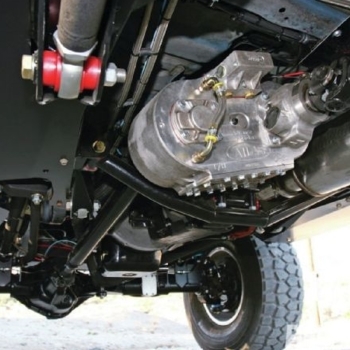 You may not know much about transfer cases, but if you have a 4-wheel drive vehicle, you've got one. It provides power to both the front and rear axles. For example, if you have an AWD (all wheel drive) vehicle, power goes to the rear wheels until you need 4-wheel drive. That's when the transfer case steps in and transfers power to the front wheels as well as the rear. AWD vehicles typically go into 4-wheel drive automatically, but 4 WD (4 wheel drive) vehicles usually need you to manually activate it. We carry a full line of remanufactured and tested transfer cases backed with our three year 100,000 mile parts and labor warranty. As well as part remanufacture / replacement, each remanufactured transfer case receives case-specific upgrades and improvements to correct manufacturing and engineering defects. The transfer case is serviced by periodically draining its fluid and replacing it with fresh fluid. Transfer case fluid cools and lubricates the gears, chains, bearings, shafts and other parts. Over time, the additives in the fluid wear out and it doesn't protect as well. Also, bits of gear and chain material wear off and contaminate the fluid. Because there is no filter in the transfer case, if the contamination is allowed to stay for too long, it will accelerate wear shortening the life of your transfer case. Fill in your information here and a service representative will contact you to confirm the time and date of your appointment. Diagnostics are always free. You can schedule a read test and estimate here as well as scheduling your vehicle for the actual work. Keep in mind that transmission problems that seem large may not be transmission issues at all. Faluty wiring can cause a check engine light and a scan that shows transmission troubles when they do not actually exist. A very inexpensive deterioriated linkage grommet can cause transmission shift to grind or slip out of gear. There are so many small things that can seem so bad that dreading a large expense can cause a person not to take care of the issue and that can result in major repairs. Schedule your appointment today. We really do treat our customers with respect and kindness. Certified Transmission California has many conveniently located transmission Diagnostic and Installation Centers throughout San Diego county. We are transmission experts and have been providing full transmission service since 1978. Whether you are considering a used, rebuilt, remanufactured, or factory transmission - we have a huge inventory of rebuilt transmissions and automatic transmission parts, we can ship out of inventory, repair or rebuild transmissions fast. Most of our centers offer no-charge diagnosis while-you-wait. This saves our customers a lot of money. So often, people come to us thinking they have a transmission problem when they don't. Why risk a wrong diagnosis when getting it right from the experts is free? We listen and respond to customer feedback. We appreciate comments, questions and feedback from our customers or customers-to-be. Our transmissions are remanufactured to OEM or BETTER standards. You just can't beat the quality. Hundreds "In Stock" means you don't have to wait for a transmission rebuild. We have yours in stock and can install it in as little as one day. We have free towing, rental vehicles, pickup and delivery and the nicest most knowledgeable staff imaginable. We are here simply to take the troubles out of transmission troubles and get you back on the road with the least inconvenience to you as possible. © 2010 Certified Transmission California - site by Scott Creative Services, Inc.